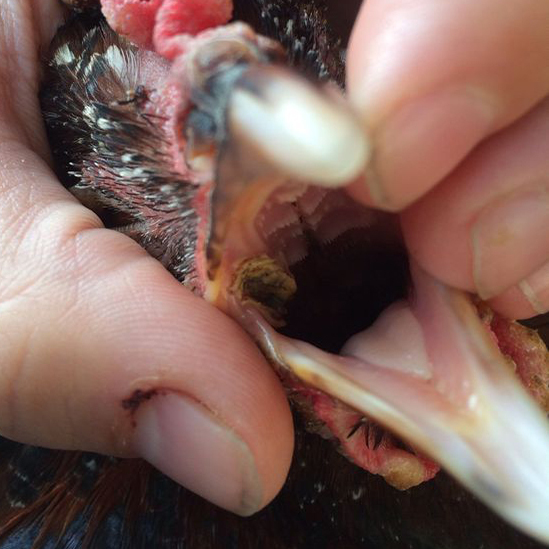 Fowl pox is a slow-spreading viral disease of chickens characterized by lesions on the unfeathered skin areas and/or mucous membranes of the oral cavity, larynx, or trachea. 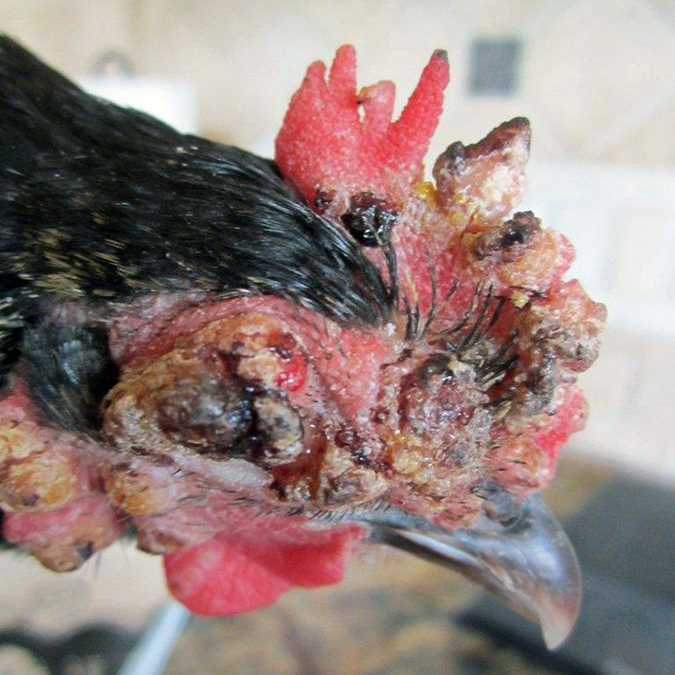 The disease is caused by the avian poxvirus which is classified as at least three different strains or types, including fowl poxvirus (FPV) that affects chickens and turkeys, pigeon poxvirus (PPV) that occurs in pigeons, and canary poxvirus (CPV) that affects different species of wild birds. 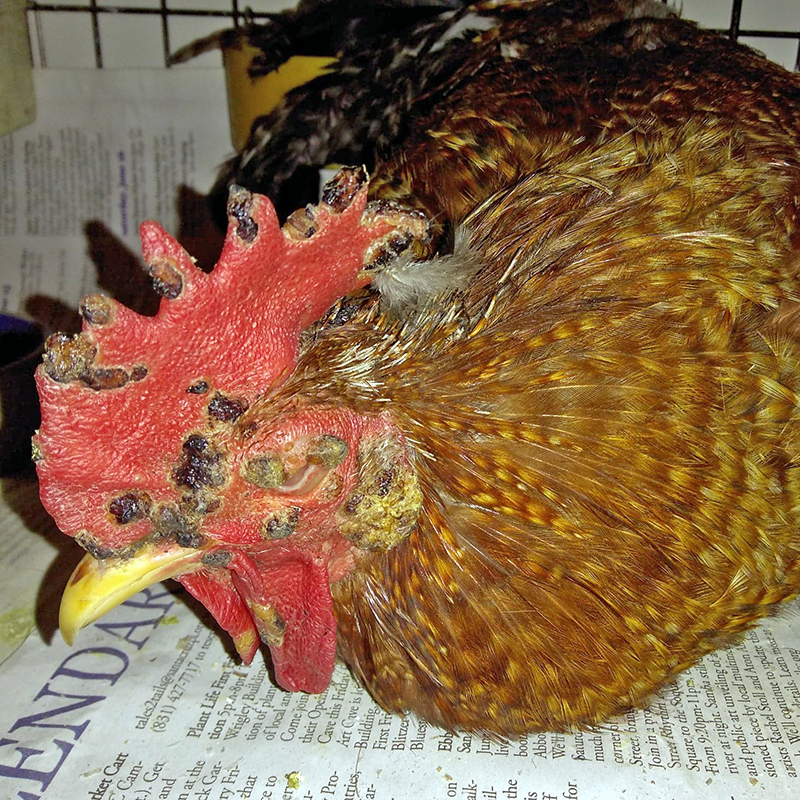 Each virus strain can only cause disease within certain species of birds. 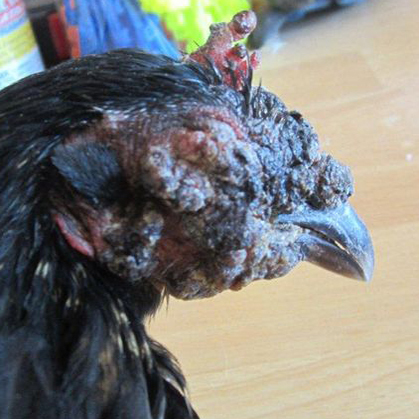 For example, chickens are not affected by infection with pigeon pox virus, and vice versa. 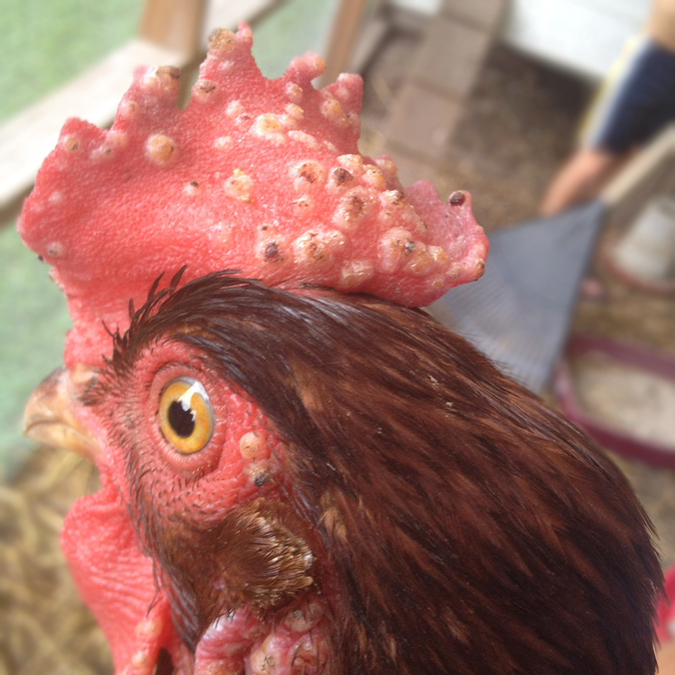 There are two different forms of fowl pox that can occur in chickens--classified as a dry (cutaneous) form and wet (diphtheritic) form. The cutaneous or "dry" pox form is the most common. 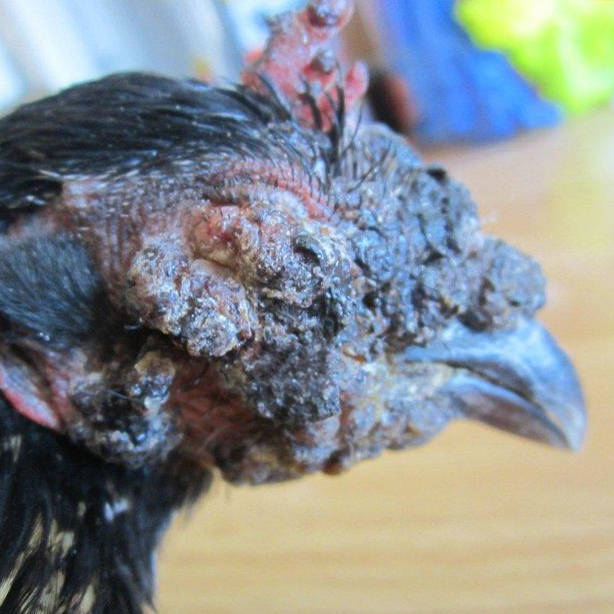 Typical pox lesions are small, wart-like growths on the skin of unfeathered areas (face, comb, wattles, eyelids, legs, and feet). These initially appear as small, yellow eruptions which gradually increase in size. Pox lesions will also change color as they grow larger, and turn into dark brown, roughened, dry scabs. The scabs will usually last about 2 to 4 weeks, afterwhich they will loosen and drop off on their own, leaving smooth scar tissue underneath. 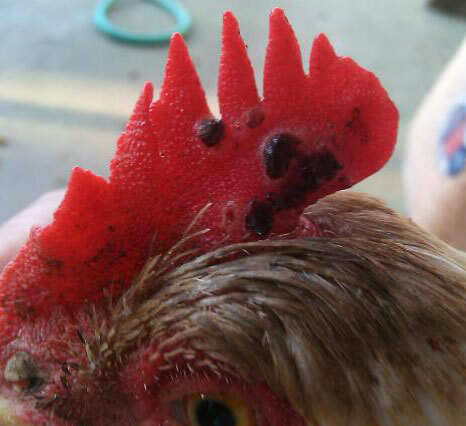 These dry scabs contain the poxvirus and are highly infectious to other flock members. 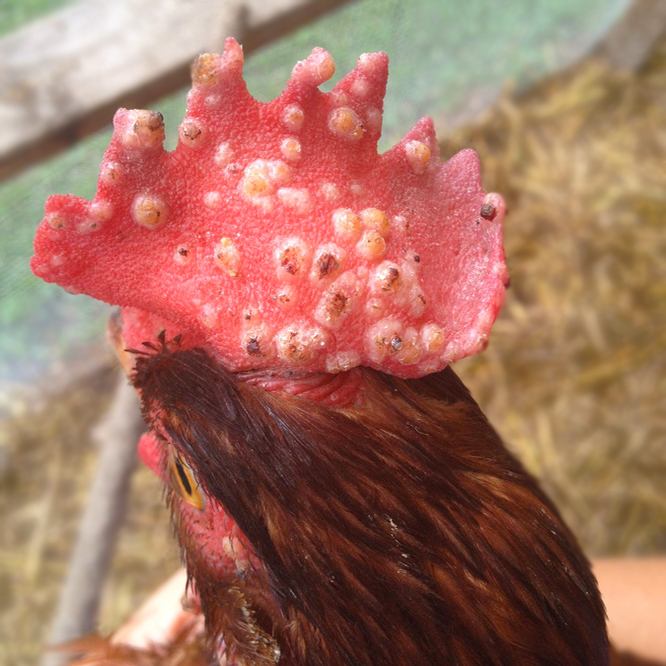 In cases where pox lesions develop near the chicken's eyes, clinical signs may initially present as mild redness and irritation and quickly progress to swelling of the eyelid and the development of ulcerative lesions along the edges of the eyelid. The eyelids often become sealed shut with caseous discharge or with dry crusting scabs which fall off within two weeks. 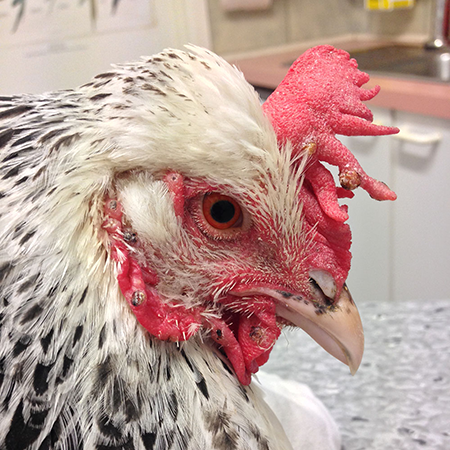 While lesions start to develop, affected chickens are at an increased risk of secondary infection. To minimize risk of infection, efforts should be made to help keep pox lesions clean. 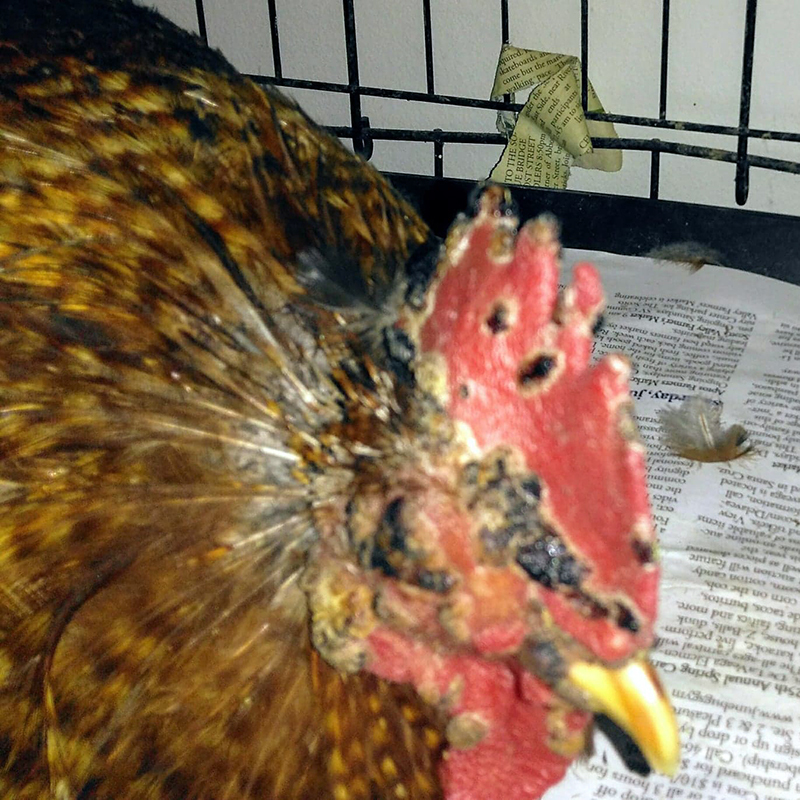 The diphtheritic form of fowl pox is associated with higher mortality in birds. 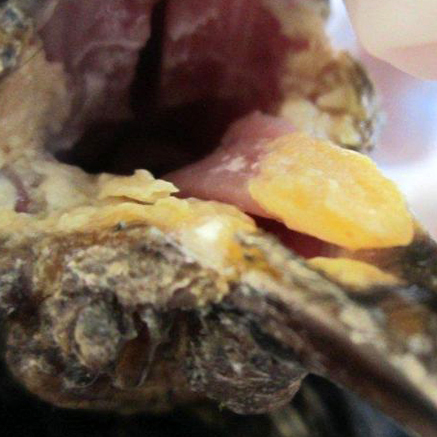 It causes plaques (also referred to as yellow canker lesions) to develop within the oropharynx (inner mouth and throat) of birds. These may start out as tiny white nodules which merge together to form raised-yellow white cheesy patches. 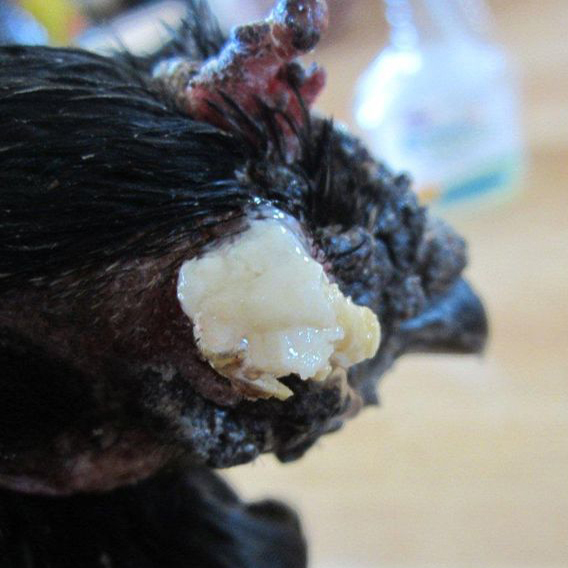 If lesions are located in the upper digestive and respiratory tract, it may cause chickens to reduce their feed intake and have difficulty swallowing. Other respiratory signs may also be apparent, depending on the severity which can range from mild to severe. 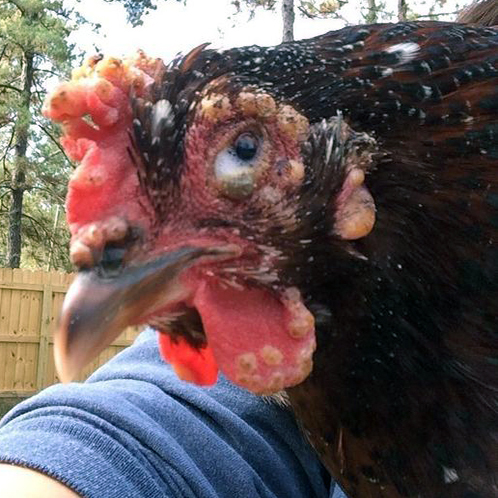 Fowl pox is transmitted to flocks through biting arthropods (primarily mosquitoes) and introduction of a new bird into the flock who is latently infected with the virus. 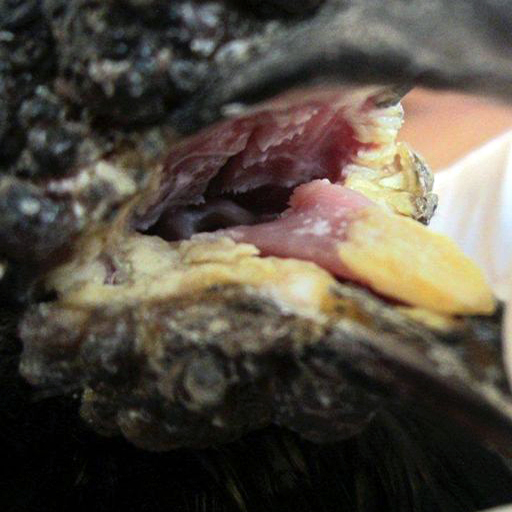 Once a mosquito feeds on an infected bird, it is able to keep the virus in it's salivary glands for up to 8 weeks. 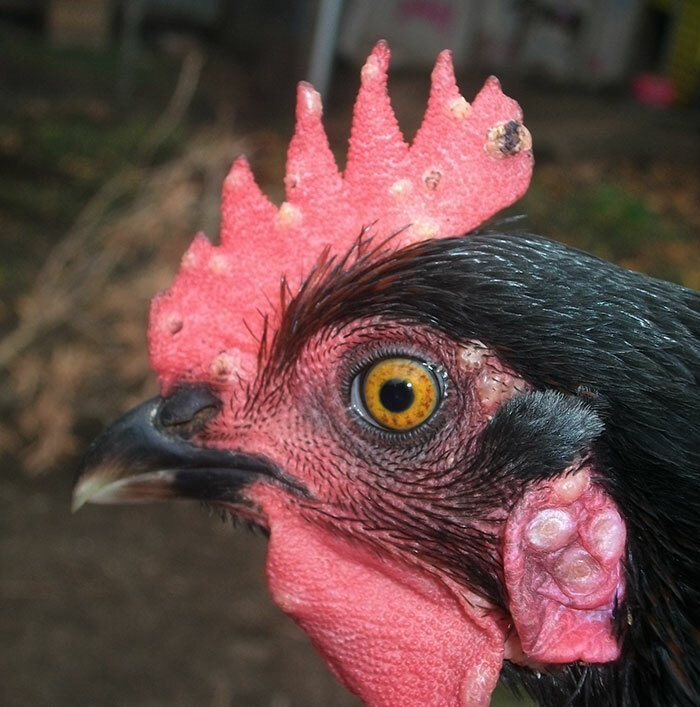 When mosquitoes bite another chicken, they are capable of transmitting the poxvirus to them. 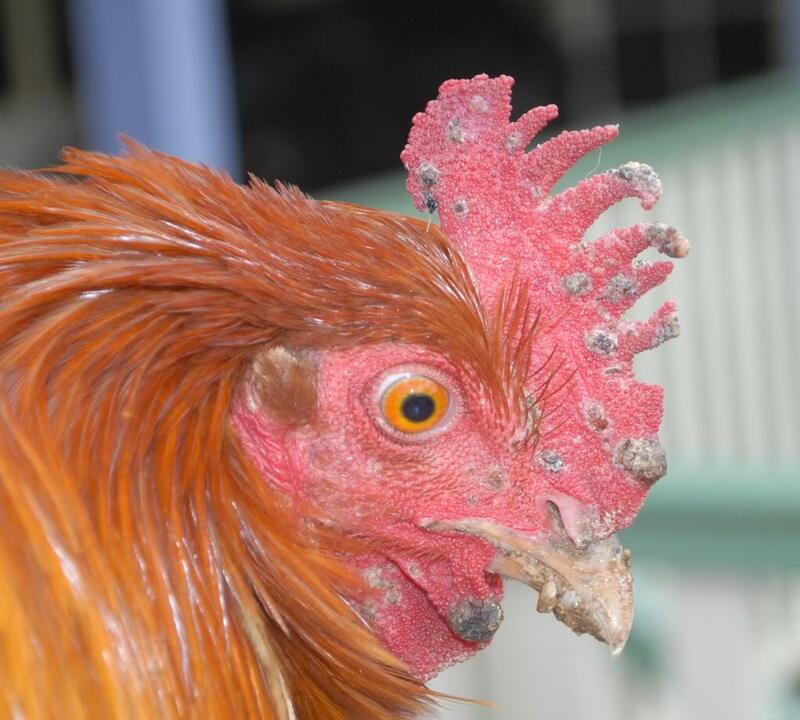 In fact, one mosquito can infect several chickens after feeding on a single bird infected with the virus. 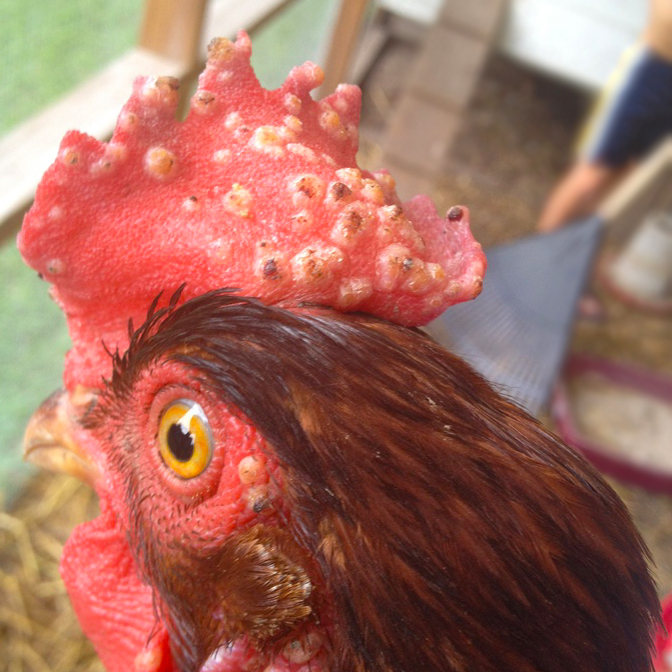 Through scratches or broken skin and mucous membranes: It is often associated with flock members pecking, fighting, or scratching at one another. 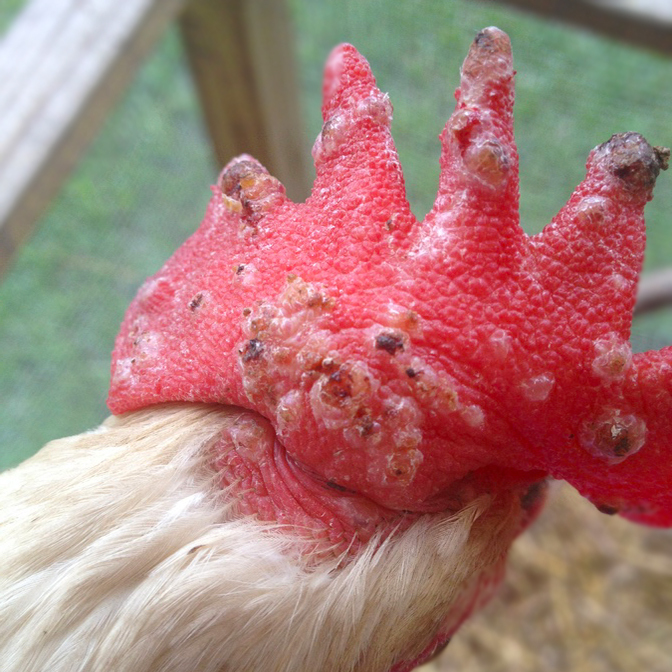 Dried pox scabs: The dried scabs that fall off of the chickens during the course of the disease can also serve as a source of infection in chicken flocks. The virus can survive in the dried scabs for months or even years. 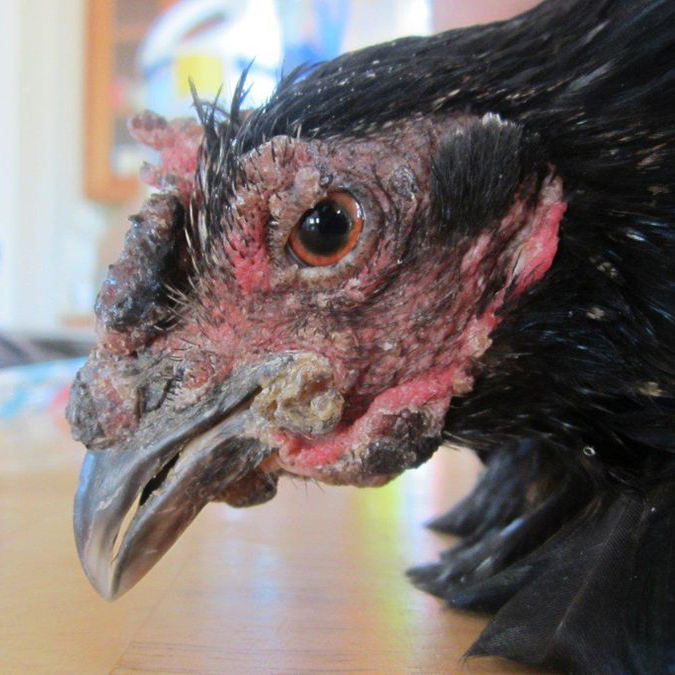 Supportive care Isolate the bird from the flock and place in a safe, comfortable, warm location (your own chicken "intensive care unit") with easy access to water and food. Limit stress. Call your veterinarian if suspect infection or any pox lesions are located near the eyes, inside the mouth, or affecting breathing. For dry pox It is important to keep pox scabs clean and dry. Only use antiseptic solution, to prevent secondary infections. The addition of glycerol or liquid paraffin wax to the antiseptic solution may have an additional benefit. Once scabs have formed, they should not be physically removed. Using a hot or cold compress soaked in baby shampoo may be beneficial to press up against scabs to help them soften. In cases involving the eyes Early lesions should be flushed with dilute antiseptic or 1-2% saline solution. Antibiotics May be necessary to control secondary bacterial infections. 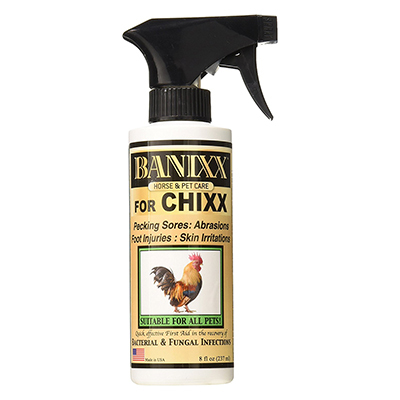 Minimize risk of mosquitoes by eliminating stagnant water sources, incorporating mosquito traps near chicken coops, utilize mosquito proof netting, and/or apply insecticidal spray (specifically made to deter mosquitoes). 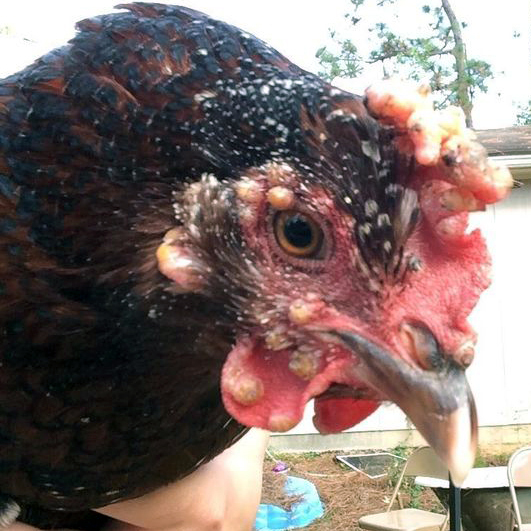 Keep mosquito repelling plants near chicken coops. Vaccination - Using wing-web stick method, vaccinate chicks at at 12-16 weeks of age, 1-2 months before egg production with fowlbox attenuated live vaccine. Vaccinate annually 1-2 months before mosquito season. 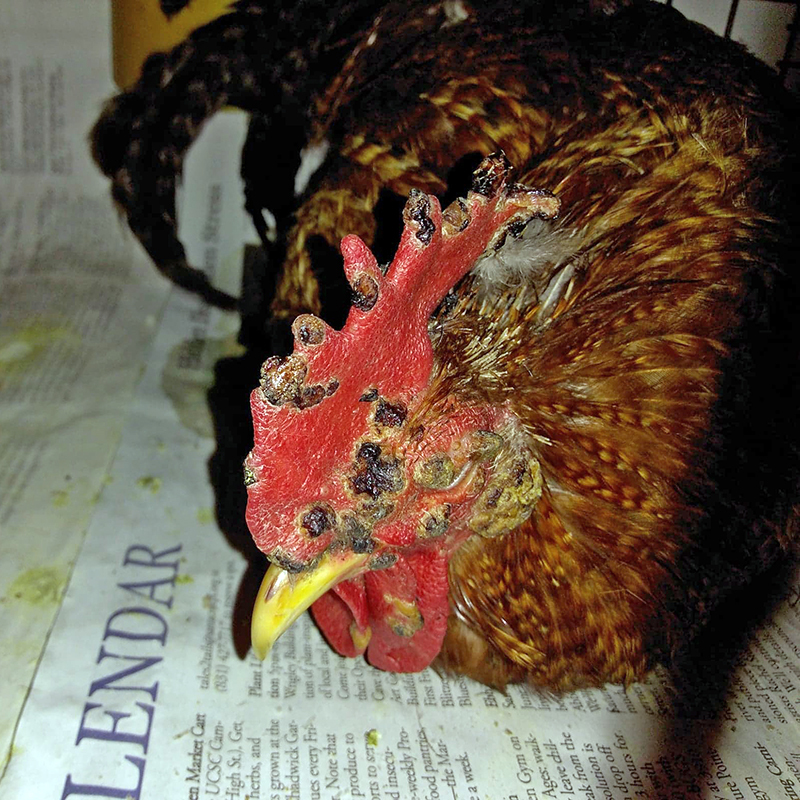 Chicks can be vaccinated at hatching with attenuated Avian poxvirus of tissue culture origin but this will not produce lasting immunity. If transmission is unlikely in the interim, initial vaccination could be postponed until after 4 weeks of age when a better and lasting immune response can be expected. Introducing a new bird into the flock.